Samuel joined The Trust in January 2006. He worked previously as the Executive Director of St. Alban's Child Enrichment Center and also Social Services Director of Richmond-Perrine Optimist Club. 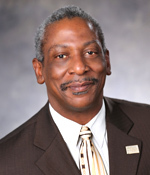 Mr. McKinnon has over 20 years of increasingly responsible work in grant and program management; policy development and implementation; and pre-delinquent child and community services. Mr. McKinnon earned a B.A. (Political Science) from Fort Valley State University in Fort Valley, GA.